This page Rosicrucianism is part of the mysticism series. Rosicrucianism is a generic term referring to studies or membership to a legendary esoteric secret society with its roots in the western mystery tradition. This hermetic order is viewed among earlier and many modern Rosicrucianists as a "College of Invisibles" from the inner worlds, composed of great Adepts, aiming to give assistance in humanity's spiritual development. Rosicrucianism was associated with Protestantism, Lutheranism in particular, and the manifestos opposed Roman Catholicism and its preference for dogma over empiricism. They also rejected Muhammad, though they traced their philosophy and science to the Moors, asserting that it had been kept secret for 120 years until the intellectual climate might receive it. 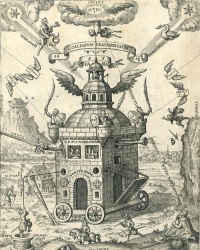 Early seventeenth century occult philosophers such as Michael Maier, Robert Fludd and Thomas Vaughan interested themselves in the Rosicrucian world view. According to historian David Stevenson it was also influential to Freemasonry as it was emerging in Scotland. In later centuries, many esoteric societies have claimed to derive their doctrines, in whole or in part, from the original Rosicrucians. Several modern societies have been formed for the study of Rosicrucianism and allied subjects. Unless indicated otherwise, the text in this article is either based on Wikipedia article "Rosicrucianism" or another language Wikipedia page thereof used under the terms of the GNU Free Documentation License; or on original research by Jahsonic and friends. See Art and Popular Culture's copyright notice. This page was last modified 07:10, 7 July 2013.